On November 21, 2014 the Texas Court of Appeals, Third District, At Austin in Cause No. 03-13-00077-CV issued its decision in a case brought by the Texas Medical Association (TMA) against the Texas State Board of Examiners of Marriage and Family Therapists (TSBEMFT) and the Texas Association of Marriage and Family Therapists (TAMFT). The court invalided a TSBEMFT board rule (22 Tex. Admin. Code §801.42(13)), which stated that a marriage and family therapist may provide “diagnostic assessment which utilizes the knowledge organized in the Diagnostic and Statistical Manual of Mental Disorders(DSM) as well as the International Classification of Diseases (ICD).” The case had been assigned to a three judge panel and resulted in a 3-2 decision in favor of TMA on this issue. TSBEMFT and TAMFT are appealing this decision to the Texas Supreme Court and the decision has been stayed pending the appeal. If the decision is allowed to stand Texas LMFTs will be unable to make a DSM diagnosis. This has serious implications for client care and billing and for other mental health professionals in Texas who do not have a license to practice medicine and who may be targeted next by TMA. An interesting side note: The two justices in the majority deciding the case both listed TMA as supporters of their election campaigns in 2012. 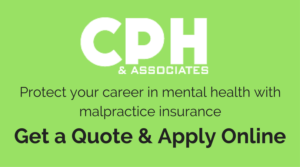 Provided by trusted attorney Tom Hartsell and CPH and Associates, your leading provider for professional liability insurance for mental health practitioners.